With The Avengers making $1 billion in less than two weeks of release, I expected there to be rumblings from DC’s camp. Lets face it, if you’re like me, a comic-book geek, right now you’re probably wondering, what if anything, does Detective Comics plan to do with their vast library of characters. Remember when a Justice League movie was rumored? Last May, Warner Bros. President Jeff Robinov declared there would be JLA film some time in 2013. Well, because of the disaster that was “Green Lantern,” development for a Justice League movie was halted and there hasn’t been any news since. I can only conclude the deafening silence means Warner Bros. went back to the drawing board. What we do know is that “The Flash” is supposedly moving forward, but at a snails pace. Two months ago in March, “Wrath of Titans” screenwriter Dan Mazeu — who wrote a draft for “The Flash” — told BLASTR “The Flash is very high on the list” of DC properties to bring to the big screen. Since 2010, the script for “The Flash” has gone through a series of revisions and it was last reported, Greg Berlanti, Michael Green and Marc Guggenheim were developing the screenplay with Berlanti rumored to direct. There is still no official word yet from Warner Bros. or DC on when the film will begin production. Which brings us to a new DC rumor. In a story printed Monday, a source told Bleeding Cool that Dwayne Johnson may portray alien bounty hunter Lobo in Brad Peyton’s film of the same name, with Joel Silver and Akiva Goldsman producing. This is a smart move from Warner Bros. — if true. With the success of “Fast Five” and “Journey 2: The Mysterious Island” abroad, Dwayne Johnson has proven to be a big international star. Rumors aside, I do think Dwayne Johnson is inking a deal with DC Comics. He hinted about it on Twitter last week when he responded to a follower’s tweet about the possibility of portraying a DC character. 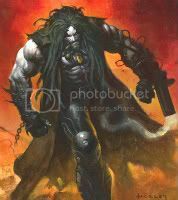 Personally, I don’t see The Rock as Lobo. I envision someone like Jeffrey Dean Morgan (“The Watchman”) in the part. As for who The Rock should play, my vote coincides with most of the fanboys. His look and demeanor best suits Caiptain Marvel’s enemy, Black Adam. What do you think about The Rock joining the DC universe? It kind of seems like it would be a waste of The Rock. I love the idea of him as Black Adam, though.